Cold Wind was before and will be after, the first of the Winds to blow among the Kaalakiota Peaks and the one that loves things that grow strong. He saw the Raata men arrive and blew his welcome among the kresh trees. He asked Wind-from-the-West about these men, and Wind-from-the-West told him tales of fires and blood and burning. But the Raata men respected the woods, the stones and the water, and Cold Wind felt happy to share his tales with them. He blew for many autumns among the Raata. He blew for many autumns until Deteaas heard him and made a flute with the bamboos, and K’vire heard him and made a harp from his bow, and they taught the other men to listen. Cold Wind told them what moons bring snows and rains, the time of the trees and the hunt, and which herbs are good to eat. The Raata listened and learned, and the wisdom from the tales made them grow strong. Other men arrived, this time from the West, and Cold Wind once again felt happy. Yet these other men brought the fire Wind-from-the-West spoke of, and the blood and the burning. They tore stones to build walls and trees to make pikes. They killed all those that were different, and claimed all these lands and waters for themselves. K’vire was fast and strong. Cold Wind taught him the words that make the bow stronger and make the arrow fly true. He taught him to move without sound or track, and to perceive the paths that are hidden. Deteaas was calm and deep. Cold Wind taught him the words that sing the deeds of heroes fallen in battle and instill fire in the heart of men. He taught him when to run and when to walk, when to wait and when to strike. The pikes of the men from the West could only find shadows that vanished before they could land a blow. Arrows coming from nowhere took first this one, then another, and another. Their sky was always covered with dark clouds; they could see the sun and stars no more. The orders their captains yelled were lost in the Wind that day and night kept screaming in their ears. The men from the West felt fear creep into their heart. Some left, then others followed, then all the rest of them. K’vire was fast and strong; his eyes filled with distant lands, he dashed to the North. Deteaas was calm and deep; his dreams filled with distant tales, he walked to the East. No man was stronger than K’vire; in time he forgot to walk and started to lead, and the northern Fuukiuye tribes followed him. None could match Deteaas’ wisdom; soon he forgot to listen and started to speak, and the eastern Oryioni people answered his call. When for the third time the son of the son became father, seventeen houses of Fuukiuye went back South, and twenty-three houses of Oryioni returned to the West. They found each other under the Kaalakiota Peaks. Time had diluted their memory; they saw the other faces were strange, the Houses’ symbols different. Each claimed these woods and waters as true heirs. And both refused to leave. In the first cold dawn of autumn two armies stood face to face, one arrowshot apart. Light snow made silence thick. Men stared men. An eagle cried, and two armies shouted in rage and clashed. The Winds saw the battle and whispered to the men to stop. Wind-of-the-West lifted the fallen snow and tried to hide one army from the other, but men were already blind with anger and fog would not stop them slicing anything that moved. Mountain Wind brought the cool of the high Peaks into the heart of the fight, yet fury was boiling in every vein and cold would not placate them. One third of the men fell, then another third. When only a fifth was still standing, Cold Wind felt his pain burn into fury as he had not known before. Blizzard and ice he spewed until no hand could hold a weapon; until friend and foe lumped blind together, seeking protection from his rage. He blew until none could stand, until every man still alive was left clinging desperately to the last thread of warmth. 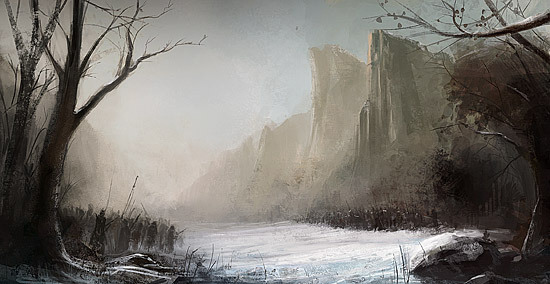 Cold Wind let his fury vanish and released his grip, and men could feel their limbs again. The men struggled to stand up and looked at their armors; the symbols of their Houses were torn and broken, not visible anymore. The men gazed at each other trying to distinguish brothers from enemies, yet the blood covering their faces made all of them alike. The seventeen and twenty-three houses became forty. K’vire and Deteaas became Raata again. From”Two Bloodlines, one Race: the Raata spirit in the Deteis and Civire soul”, Lai Dai Press, YR87. Reprinted with permission.